Today I will share a delicious pasta recipe that needed just a bit of editorial help. I'm particular about how a recipe is written. It should be straightforward, with the steps written in the same order that they are cooked. But you'd be surprised how many recipes require a round of deciphering before they can be put into use. Today's recipe, which came from the otherwise exceptional 365 Ways to Cook Pasta, was just such an example. You can see in this picture how the recipe follows the typical, rote format of listing all of the ingredients up top, and then listing all of the cooking instructions after that. Seems reasonable, right? Except on this occasion, it's exactly the worst way to write a recipe. You see, this pasta dish is really three quick mini-recipes in one. There's an artichoke heart marinade, which you make ahead of time. 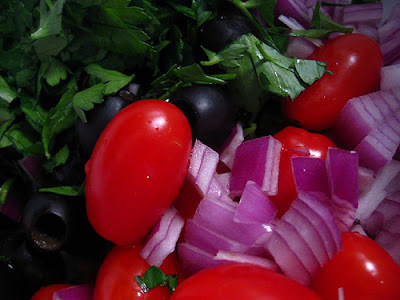 Then there's the veggies, parsley and olives, which get chopped up and wait in a bowl for everything else. And then there's the shells and shrimp. To list all the ingredients together, especially when it's a long list of 14 or so items, is pointless. 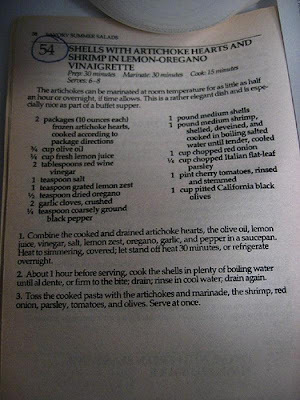 It just adds to the confusion and makes the recipe hard to read. Of course even a confused recipe can still taste amazing. And this dish was a real keeper. But just as some of the best recipes come from the most unassuming places, sometimes they, uh, come from the minds of unassuming writers. Thus this recipe just needed a little editorial surgery. So I rewrote the recipe in three discrete mini-sections, with the ingredients for each process step broken out separately. I'm curious: do readers out there have the same difficulties that I have reading and processing a recipe like this when it's put together in this traditional, rote format? Seems to me that the more ingredients and the more steps involved, the better it is to write it in a format broken down by process steps. Take a look at my rescripted version of the recipe below and let me know what you think! Combine the above ingredients in a medium saucepan. Heat to simmering, then let stand and cool for 30 minutes. You can also refrigerate overnight for a stronger marinade. Put these ingredients in a extra-large bowl and set aside. Cook the shells in plenty of boiling water until al dente; drain. 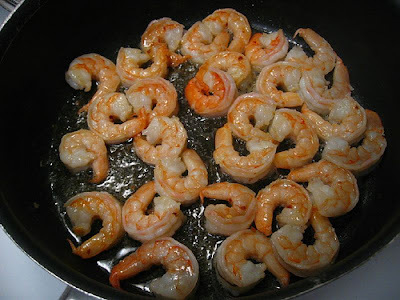 While the pasta is cooking, heat a few tablespoons of olive oil to medium-high heat in a non-stick pan; add the peeled shrimp, shake in some red pepper flakes, and cook them for 3-4 minutes per side, depending on shrimp size, or until done (do not overcook!) 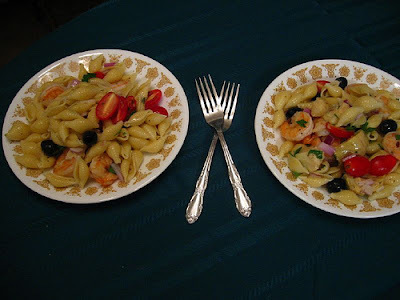 Throw the pasta, shrimp and artichoke marinade sauce into the extra-large bowl (along with the red onion, parsley, tomatoes and olives), toss well, and serve at once. As I've done for several other posts on this blog, I've loaded the entire set of photos from the making of this recipe over at flickr for anyone interested in more detail. Have a look! Ooh that sounds good... any ideas for substitutions from this non shrimpfetishist? Hearts of palm? Just more pasta? Sure, I think heart of palm could substitute for a veggie-friendly version. Does anybody else have any suggestions? I normally don't have a problem with a recipe with a long ingredients list, but I find it helpful if the ingredients are listed in the order YOU presented them... so if I'm using x and y together they should be listed together. Baby portabello mushrooms (or slices) would be a nice substitution for shrimp in this recipe. Or if you want an alternate protein and just don't like shrimp you could always use chicken or scallops. Portobello mushrooms! That is an exceptional suggestion. Thanks for the idea! Listing ingredients in their order of importance is the European style, it helps cooks know which ingredients can be most/least easily substituted / adjusted. Good point. Thank you for your comment!